Wildwood Soup Kitchen provides free delivery of meals Monday through Friday to Wildwood residents who are confined to their homes. Our drivers can deliver a limited number of meals on existing delivery routes; thus home delivery is dependent on location and space availability. Be sick, infirmed, handicapped, recovering from surgery or aged; they must be unable to leave their homes. Live within the city of Wildwood or the area near the Wildwood Soup Kitchen at 203 Barwick St. in Wildwood. Meet with the Driver Coordinator in order to appraise the home situation. This appraisal will determine eligibility for home-delivered meals as well as the length of home delivery. The meal to the right is typical of meals delivered by our drivers. 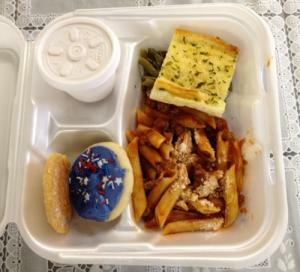 To discuss the possibility of home-delivered meals, contact Barbara McManus at 352-299-6494.